Running numbers: 2221 - 2250. 1912 (2241 - 2250) to lot number 188. 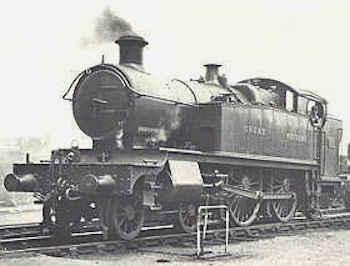 The tank version ofthe 'County' class tender locomotive had the same 6 feet 8½ inches driving wheels as the 'County' but with a pair of trailing wheels, however the main difference was the use of the Standard number 2 boiler compared to the number 4 boiler employed on the tender engine. The size of driving wheel was the largest used for a tank locomotive on the standard gauge. The class were introduced to gradually supersede the 3600 'Birdcage' 2 - 4 - 2T class. The first 20 engines had the square shaped front frame whereas the final 10 had the fashionable curved framing. Interestingly, the framing of the first 20 were never modified to the curved shape. Similar rough riding to the 'County' tender engines was experienced due to the large reciprocating masses, and together with the enhanced traction capabilities of the 2 - 6 - 0 Moguls, 4 - 6 - 0 Halls and 2 - 8 - 0Ts, meant that all but three of the class had been withdrawn by 1934.